For the 24 hours to 23:00 GMT, the EUR declined 0.79% against the USD and closed at 1.2309. In economic news, Germany’s GfK consumer confidence index unexpectedly rose to a level of 10.9 in April, defying market expectations for a drop to a level of 10.7, thus indicating that consumers are regaining confidence in the country’s economic strength. In the prior month, the index had registered a level of 10.8. The US Dollar advanced against a basket of major currencies, after data revealed a sharp upward revision to US GDP growth in the fourth quarter of 2017. The third estimate of the US annualised gross domestic product (GDP) was revised higher to 2.9% on a quarterly basis in the final three months of 2017, boosted by robust jobs growth and healthy consumer spending, while the preliminary print had recorded a rise of 2.5%. The nation’s GDP had risen 3.2% in the prior quarter. Additionally, pending home sales in the US rebounded 3.1% on a monthly basis in February, rising for the first time in 3 months and exceeding market consensus for a gain of 2.0%. In the previous month, pending home sales had dropped by a revised 5.0%. On the other hand, the nation’s advance goods trade deficit slightly widened to $75.4 billion in February, from a revised deficit of $75.3 billion reported in the prior month, while investors had envisaged it to narrow to $74.4 billion. In other economic news, the MBA mortgage applications in the US grew 4.8% in the week ended 23 March, compared to a fall of 1.1% in the prior week. In the Asian session, at GMT0300, the pair is trading at 1.2323, with the EUR trading 0.11% higher against the USD from yesterday’s close. 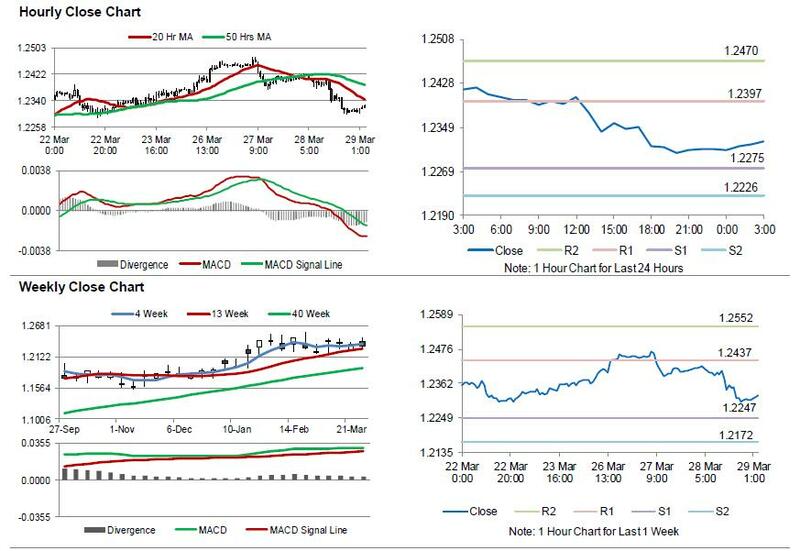 The pair is expected to find support at 1.2275, and a fall through could take it to the next support level of 1.2226. The pair is expected to find its first resistance at 1.2397, and a rise through could take it to the next resistance level of 1.2470. Trading trend in the Euro today is expected to be determined by the release of Germany’s unemployment rate and flash consumer price inflation data, both for March, due to release in a few hours. Later in the day, the US initial jobless claims, followed by personal income and spending data for February as well as the final Michigan consumer sentiment index for March, will garner a lot of market attention.